A call to Harry Peralta at Engel & Volkers Yachting in Puerto Banus brings details of his latest central listing, the 30.5m motor yacht Kirios. Built by Astondoa in 2006, she sleeps eight guests in four staterooms and twin 2000hp MTU engines give her a cruising speed of 24 knots. 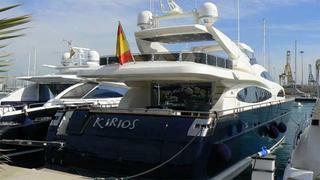 Lying in Spain, Kirios is asking €4.75 million, VAT paid.